Your GPS can tell you the fastest route, or the most direct. Now it can also tell you the most fuel efficient. 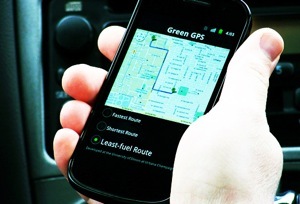 By mashing up information from your car’s onboard computer about your engine’s efficiency with traditional GPS software, Green GPS gives you the route that will keep you going at your car’s optimal speed. In tests of 16 vehicles over 1,000 miles in Urbana-Champaign, the system reduced gas use by 13% over cars that took the GPS-recommended fastest route. Now the system is being tested on the 200-vehicle fleet of the University of Illinois’s Urbana-Champaign campus. If that’s a success, expect to see it as an option for you soon–IBM and the National Academy of Sciences are both already signed on as funders. As the system expands, you won’t even have to take the complicated step of downloading your car’s individual diagnostics into the system; the data of cars similar to yours will already be available. A full 30% of America’s fuel use comes from transportation. Ideally, we’d reduce that by 100 percent by using electric cars. But, excitement for the Volt aside, we could use some stopgap measures to reduce fuel use before we eliminate it entirely. Using 13% less just by following a slightly different route is low-hanging fruit of the most delicious variety.